CoLab Radio » Blog Archive » The U path: a spark ignited in Yarrambat. The U path: a spark ignited in Yarrambat. In a recent blog entry, “Where does the time go”, I mentioned my wonderful experiences with the slower pace of life in community at the edge of the “bush” in Yarrambat, Victoria, Australia. There is much more to the story. It was mid November, 2010 when a group of people from diverse backgrounds and geographies gathered for two days in Yarrambat to, well, to be creative; to get to know one another; to enjoy some scones, jam and tea; to listen carefully; to be present to one another; to share our stories and our wisdom; to reflect upon why, how and where community forms and sustains itself. One of my roles in this gathering was to share my experiences in Asset Based Community Development as a shalom-maker (co-creator of community well-being). The path of the “U” as I am using it can be seen as a general spiritual path, giving access to a life of “earth community” rather than empire. 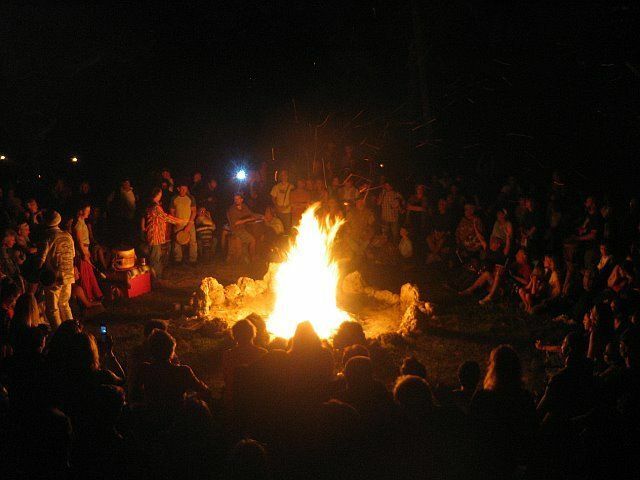 A range of spiritual traditions, philosophies and models can be seen to give access to the path… it [the U path] is like an inviting campfire, around which are drawn various parties interested in ideas of post-colonialism and non-violence and from backgrounds across, organizational development, community development, faith development and national and international development. And, so it happened last November. We dipped into the “U” and emerged with fresh new connections and concepts that bridge across our various communities. Participants of various faith traditions and professional disciplines were profoundly moved and felt the synergy to continue conversations, connections, and plans; even across the planet. From the spark ignited at Yarrambat, and continuing on the U path, community is both expanding and converging. As social entrepreneur, writer, teacher and developer Gail Plowman writes in “Dealing with social problems that get stuck” and “The Church – a ‘presencing’ body for advancing sustainability”, the transformational processes of community-building are taking place in ways and locations previously unimagined. Creating conditions for more people to follow the “U” path therefore means creating the conditions where truly unique neighbourhoods can develop in every place and time. Nurturant, local neighbourhoods are the spaces which can be made safe enough for the true selfhood of the individual to emerge. This means that there must be heightened awareness of the educational, organisational, philosophical, spiritual and political conditions which create such neighbourhoods. Theory U from the Presencing Institute. Where is your community on the U path? Post by N. David (Dave) Cooper, MDiv, MSW, CPM of Shalom-Makers: enlarging the circle of community.